Includes video instruction for each recipe. Last year my Christmas wish was to spend at least one month in France in the new year, just to enjoy the lifestyle. After ringing in the New Year and didn’t give it considerable thought as I made my months went from winter to spring. In mid-summer, much to my surprise, I received an invite from Chef Katherine Frelon to attend her cookery school in the Burgundy region of France at La Ferme de La Lochere in late August. It was my Christmas in July! The incredible French countryside adventure I had been dreaming of was actually going to happen. As I was planning my own last minute holiday menu, I thought why not share all that I learned from Chef Katherine Frelon while in France with my guests. So with that said, I give you Katherine’s recipes for delicious gourmet cuisine that are good enough for your very own holiday dinner or any time of year. Veloute is a smooth and creamy soup. This recipe features celeriac. If you’re not familiar with celeriac it is a turnip-root vegetable or sometimes referenced as a celery nob. 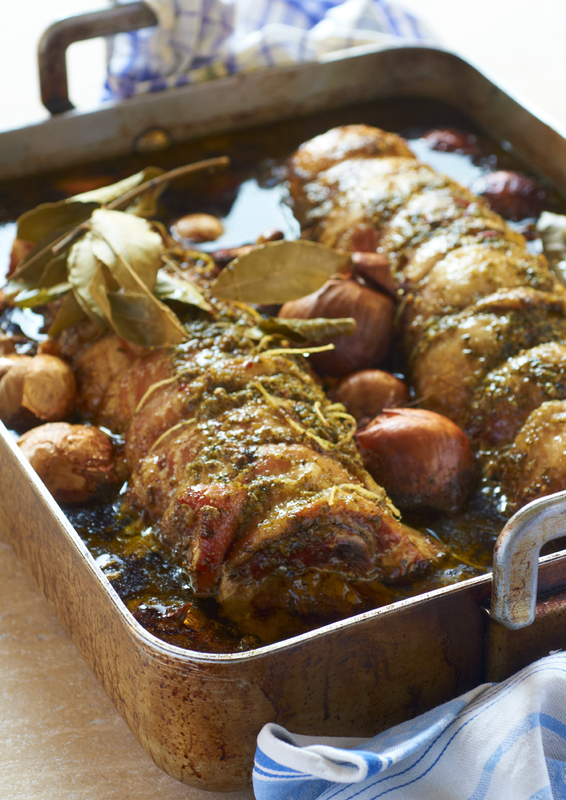 I love to serve this with warm spiced bread and curl up in front of the fire. Watch my video to see this dish come to life. Let me know what you think of this recipe below! Melt the butter & heat the oil in a large heavy bottomed saucepan. Add the onion and soften without colouring. Add the celeriac and mix well. Add the white wine and vegetable/chicken stock. Puree the celeriac, adding most of the cream/milk to the soup. Warm through and serve into warm bowls. Decorate with a swirl of cream and a little lemon olive oil. Serve with some delicious warm spiced bread. Looking for a little something to enjoy while sipping on your holiday cocktail? Katherine’s Goats Cheese & Brioche is a a simple supper starter or perfect as a light lunch. This recipe will kick-off any meal in style! Cut the brioche into squares, circles or rectangles and put on a baking tray. drizzle with olive oil, crush between your hands the red peppercorns whilst moving over the goats cheese to scatter them over the top, sprinkle over the caraway seeds, salt and pepper – set aside until needed. Preheat your oven to 180oC, gas 6. Meanwhile in a large frying pan melt the butter and a splash of olive oil. Add the shallots and soften, then add the mushrooms – remember if you are using dried mushrooms you have to soak them in warm water first for 30mins then drain and squeeze out the excess juice, keep the juice for soups it has a lovely wild flavour! Let the mushroom absorb all the liquid in the pan and then turn up the heat and add the vinegar. Let all the liquid disappear and add the wine, reduce by half before adding the cream. Whilst this is reducing add your brioche and goats cheese to the oven for 10mins. Season and taste the mushrooms. When the cream starts to thicken turn off the heat and stir through the herbs. Take the goats cheese brioche out of the oven and place on a serving platter or plate up as if to serve to your guests. Spoon over the mushroom cream and serve. For an extra treat a small slice of foie gras on the goats cheese just before spooning over the mushrooms is divine! During the holidays our thoughts turn to comfort food and warm dishes that will keep us cozy all season long. If you’re looking for a delicious meat dish to wow your family or guests, Katherine’s Slow Braised Pork Belly is sure to please. She likes to pair this with seasonal vegetables and wash it down with a glass of Pinot Noir from Vignoble de Flavigny-Alésia, one of her favorite local vineyards. With a sharp knife, take the skin off the pork belly and keep for crackling. Turn the pork belly over and cut off the ribs, (use to lay in the bottom of the roasting tin and place rolled pork belly on top during cooking). Mix 1 tbsp sea salt and coarsely ground pepper together with 5 tsp of red pepper corns rub generously all over the pork both sides. Spread the herb mixture over the rib side of the pork. Roll the pork lengthways tightly to form a long roll. Secure with butchers’ string every 4cm. Cut the onions into halves leaving the skin on and place in the bottom of the roasting pan. Place the meat in and add the bay leaves. Half fill the pan with hot water or wine. Cover very tightly with foil twice. Place in the oven on the minimum heat for 10 hrs. Take out and wrap the meat in foil and cool until it can be put in the fridge for 24hrs. Peel the skin off the onions and blend the onions with the cooking juices to form an onion sauce. Use this with half a bottle of cider, 300g apple purée and a splash of cream to eat with the pork. Simple and delicious! 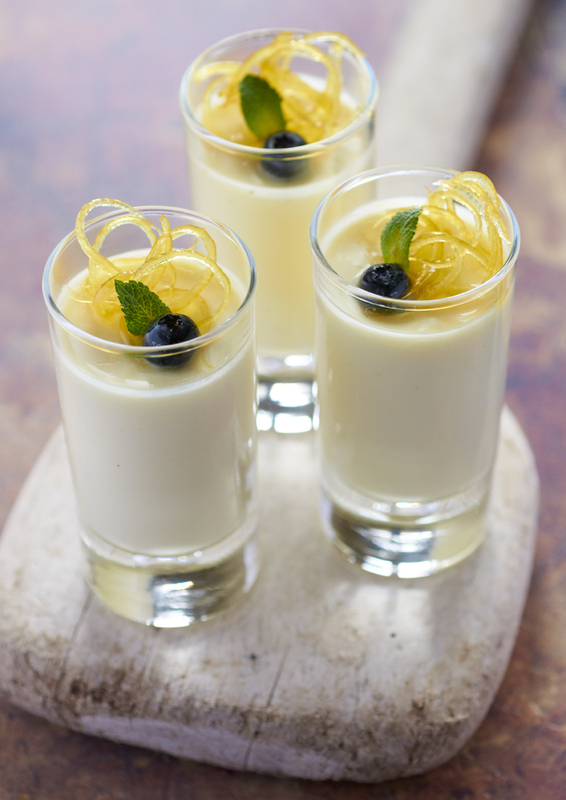 Learn to make Lemon Posset. My video shows you step by step, how to make the Lemon Posset and below I’ve included some extras if you want to embellish this delightful recipe further. This dessert is one you’ll see me making in my own kitchen quite regularly. It’s top of my list because I’m a huge fan of lemons, but more importantly it’s quick to make and always impresses my guests! Pour cream and sugar into a large saucepan and boil for 3 minutes. Whisk in the lemons and strain. Put 1/2tsp of lemon curd in the base of each serving pot and gently pour the cream in, chill until they have set, approximately 4hrs. Roll out the shortbread dough to 3mm. Using a fluted pastry cutter cut out small circles approximately 3cm diameters. Carefully place on a lined baking sheet and baking in a moderate oven until they just start to colour. Pipe a small amount onto half the shortbread discs. On your chosen plate place a pot of lemon cream and next to it a shortbread biscuit with mascarpone and blueberries. To read the Luxe Beat Magazine version of this recipe click on the title Lemon Posset with Lemon Curd and Shortbread.